The leading cause of death in the Oklahoma City bombing was from flying glass. Vandals shoot out storefronts with pellet guns in the middle of the night; leaving those businesses vulnerable to looting, and requiring expensive “board ups” and glass replacement. And these days it seems everybody knows someone whose home was broken into while they were at work, or away on vacation. How did the thieves get in? Probably through a window that they kicked in or broke in some fashion. An affordable application of Armorcoat™ Safety and Security Window Film can protect your home or office with a significant level of impact-resistance. A pellet gun can shatter a window; but Armorcoat can hold the broken glass in place – many times eliminating the need for board ups while waiting for replacement glass. “Smash and grab” artists looking for quick entry are routinely deterred because of the effort required to penetrate the window, or the noise they make while trying. 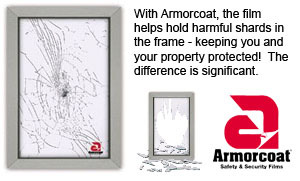 Armorcoat can protect you and your family from injury due to accidental breakage. And yes; Armorcoat is commonly used on government offices (including our nation’s Capitol) and large street level windows in urban areas as a tested and proven blast mitigation product. Also available in “sun control” versions; Armorcoat can reduce heat input through your windows and reduce your electric bill; all while making your home or office more comfortable!